A lady I once knew believed that if she ate a chicken, she ought also to have raised it and executed it. She did not extend this holistic principle to all aspects of her life; rather, she inserted it here and there. Andy Crouch, in his article “Eating the Supper of the Lamb In A Cool Whip Society” considers this sort of insistence on doing some things the hard way a good thing. Clearly, one couldn’t go into the kitchen and mix up a batch of Cool Whip. Technology whips up the Cool Whip and presents us with a time and trouble saver. Instead of whipping the cream, one opens a carton, and the people who begin their cooking careers with Cool Whip may never even attempt to deal with the real thing. So what? Well, says Mr. Crouch (and Mr. Borgmann), there is an inherent satisfaction in owning a skill and using it. When we give up our skills in favour of convenience, we lose something valuable. On another level, spending our time to do something technology could do for us, and happily taking on that burden is good for the spirit. And a meal home-cooked without convenience foods is, Mr. Crouch acknowledges, a burden of sorts even for the enthusiastic cook. It is a personal sacrifice of time and energy that spreads around a lot of happiness–both to whoever is doing it and to those for whom its done. The article is thought-provoking without being cranky. Neither Mr. Crouch nor Mr. Borgmann are 21st century Luddites who eschew all labor saving devices as a matter of course. 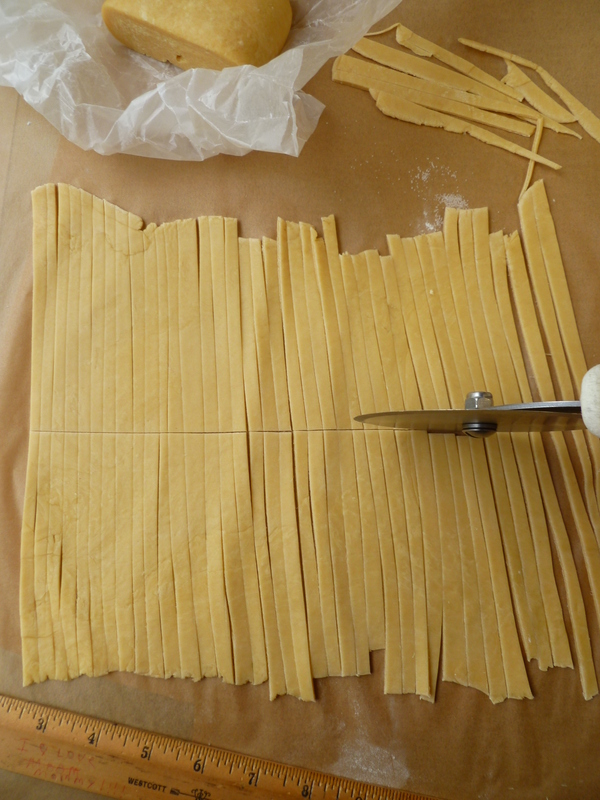 Homemade Egg Noodles is a likely candidate for applying the principle of ‘doing it the hard way’ for the sake of one’s well being and happiness. The recipe is adapted from one by Edna Lewis that appeared in her first cookbook, written in collaboration with her student and friend Evangeline Peterson. 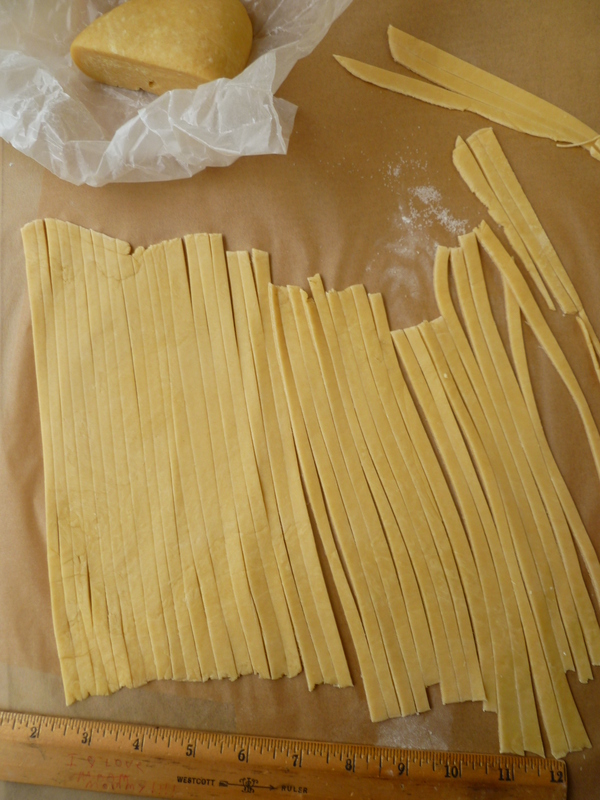 A homemade noodle is hardly recognizable as a relative of a packaged one. They have about as much in common as… real whipped cream and Cool Whip. 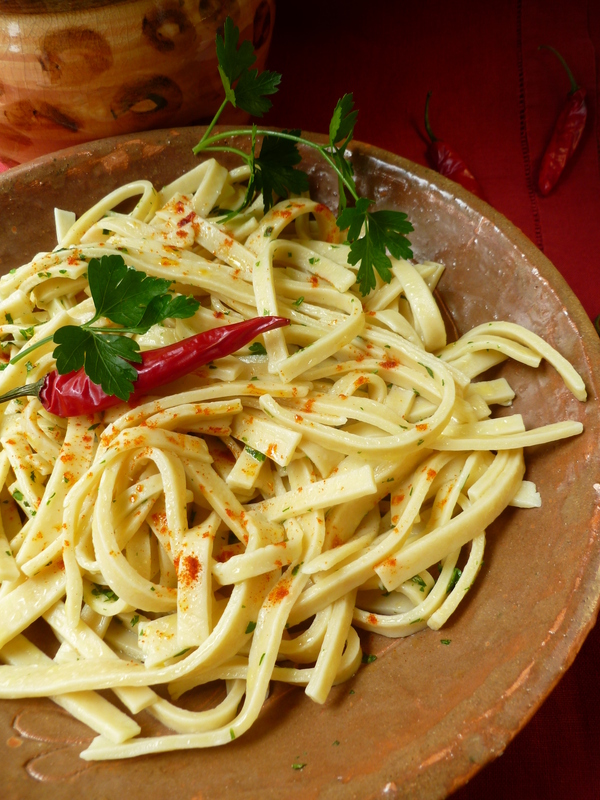 A Timing Note: The noodles may be made, dried for an hour and cooked. Or, they may be made a day ahead and dried overnight. They should be cooked just before serving. 1 and 1/2 cups of White Pastry Flour: Regular unbleached White Flour will be fine, too. a Food Processor fitted with the Rotary Blade, if you prefer not to include mixing the noodle dough as a part of your homemade effort: The dough for the pictured noodles was mixed in a processor. To mix the dough by hand, you will need a large Mixing Bowl. Both methods are outlined in the recipe below. 1. To make the dough in a food processor. Pour the flour and salt into the bowl of the processor (fitted with the rotary blade). Press the Pulse button to mix them together. Then turn on the processor and holding down the lid of the processor firmly with one hand, pour the beaten eggs into the flour through the tube of the processor. (Holding down the lid will prevent it from jerking–and possibly cracking– when the dough forms a ball.) Gradually the mixture will leave the sides of the bowl of the processor and form a ball. 1. To make the dough by hand. Mix the flour and salt together in the bowl. 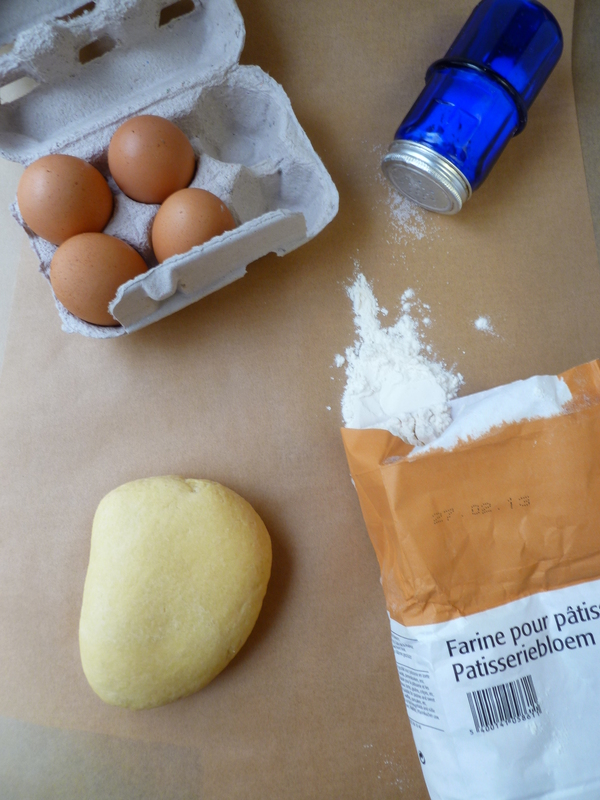 Make a well in the center of the flour and pour in the eggs. 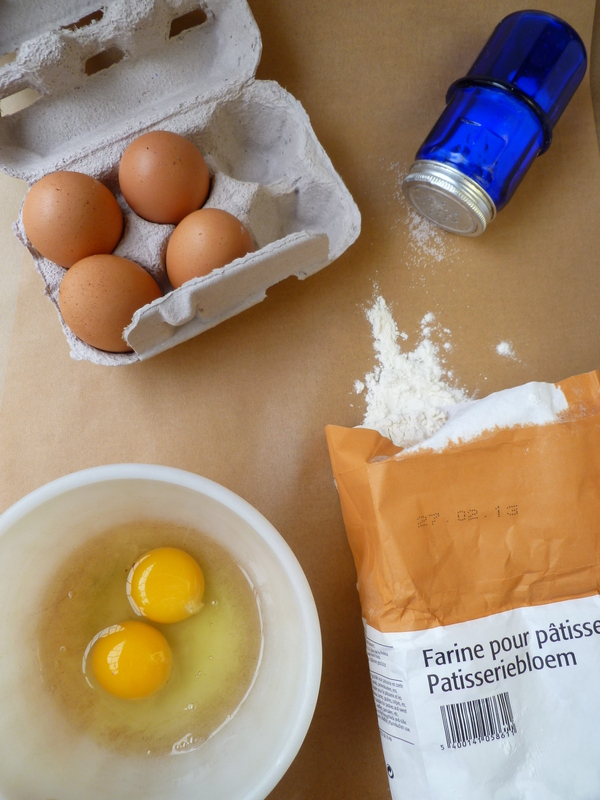 Mix the eggs and flour together with your hands. Press and squeeze the mixture to combine it and when it is still ‘scrappy’ turn it out on the pastry board to knead. Use your fists on the mixture, pressing down on it and kneading it vigorously. 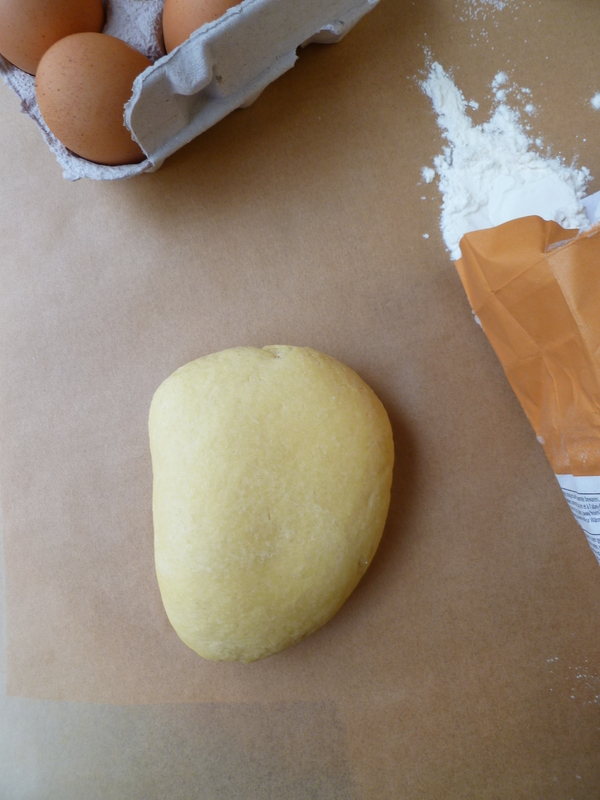 Forming the dough will take time, but eventually the flour and eggs will form a smooth, dry ball. 3. Cut the dough in half and roll out half of it on a lightly floured pastry board. (Have extra flour on hand in case the dough begins to stick–but it is unlikely to do so.) 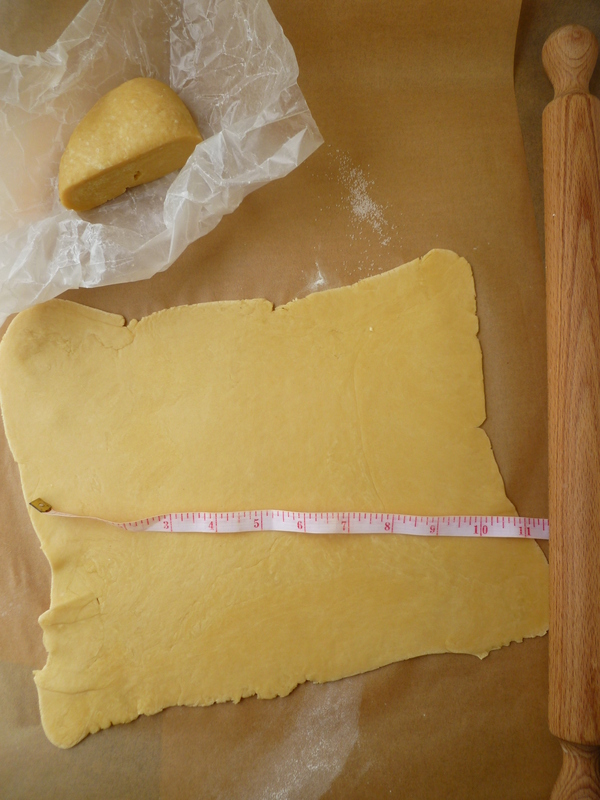 Roll the dough as thinly as possible–(between 1/8 and 1/16-inch thickness is about right)–into a rough rectangle measuring about 9-inches by 10-inches. 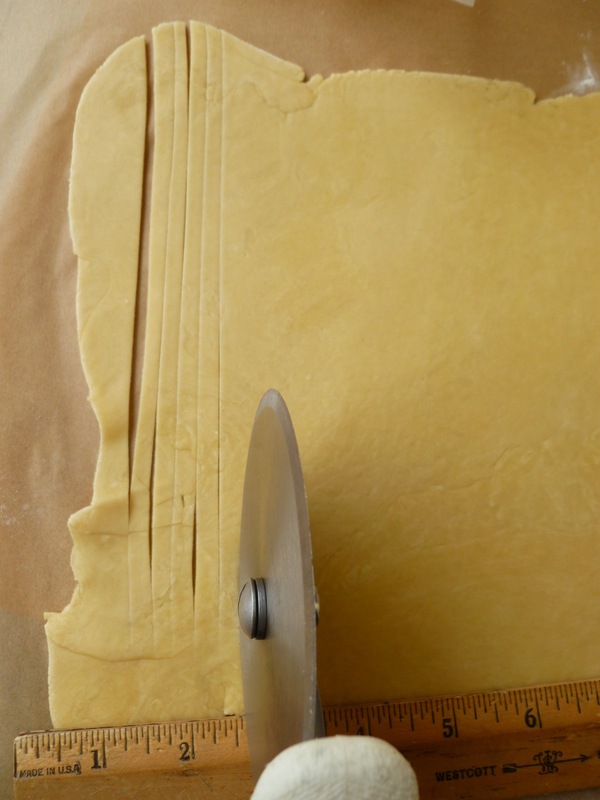 Roll the dough from the middle, outwards, so that the edges of the rectangle do not become significantly thinner than its center. The dough may have a tendency to shrink back as it is rolled out. Flip it now and then as you form it. 9. Bring a large pot of water to a boil and add 1 Tablespoon of salt. Add the noodles and boil them for 15 minutes. 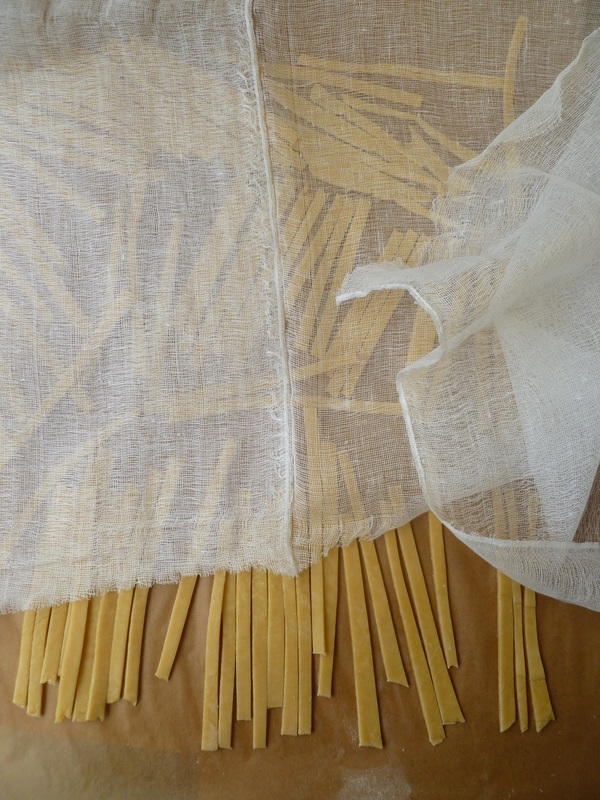 They will puff a little and will lose all superficial resemblance to Italian pasta. When done they are very slightly chewy. 10. Drain the noodles well in a colander. Transfer them to a bowl or casserole and mix them with the melted butter and the chopped parsley and sprinkle them with a little sweet paprika. Leave them in the bowl for serving or divide them among plates. 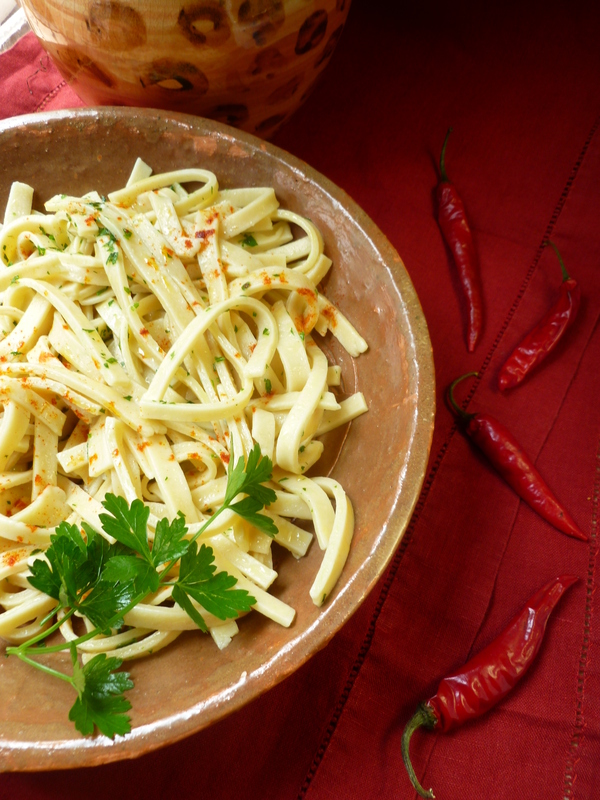 If the noodles are being served plain, at the side of a main course, a branch of fresh parsley and a fresh red chili arranged on them in the serving bowl or on individual plates will look pretty. 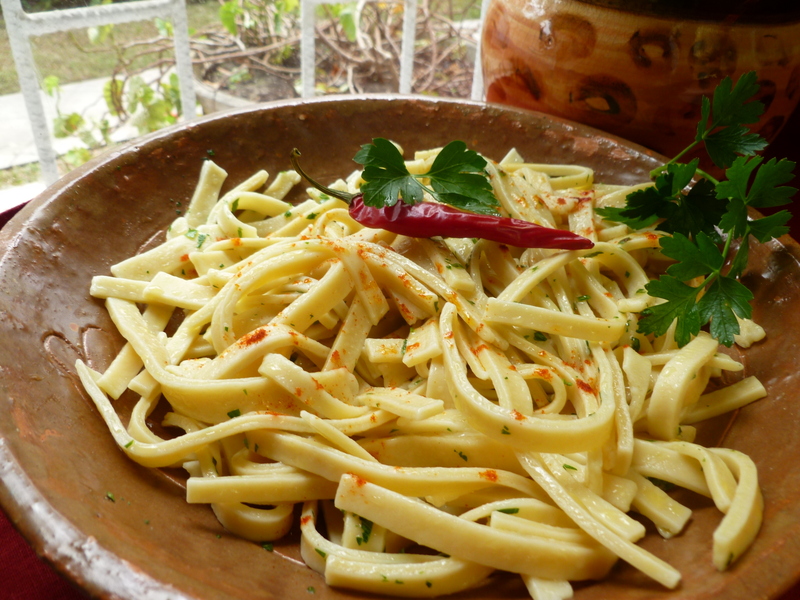 A Note: Homemade Egg Noodles are served with the Main Course Maple and Mustard Glazed Roast Loin of Pork with Paprika and Mushroom Sauce in the Dinner Menu: Magyar Accents ~ a Dinner for Four. 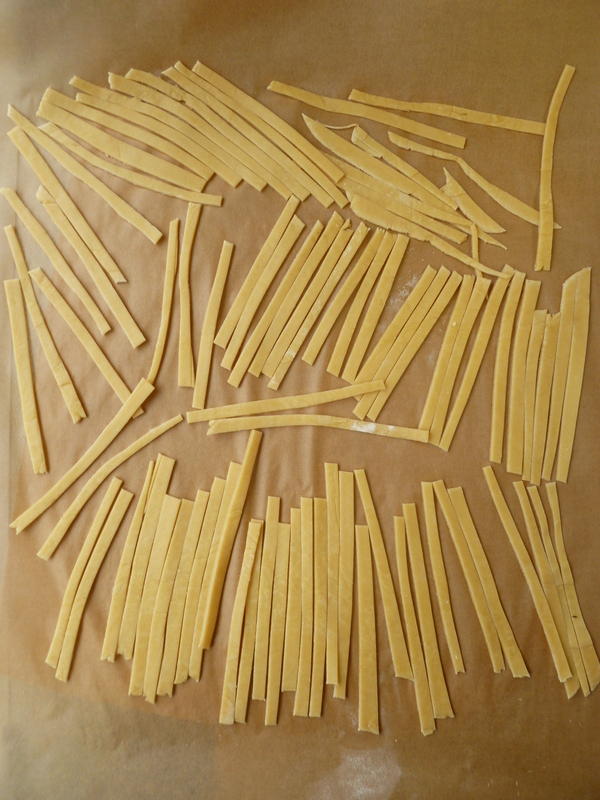 Homemade Egg Noodles is adapted from a recipe in The Edna Lewis Cookbook by Edna Lewis and Evangeline Peterson (1972). 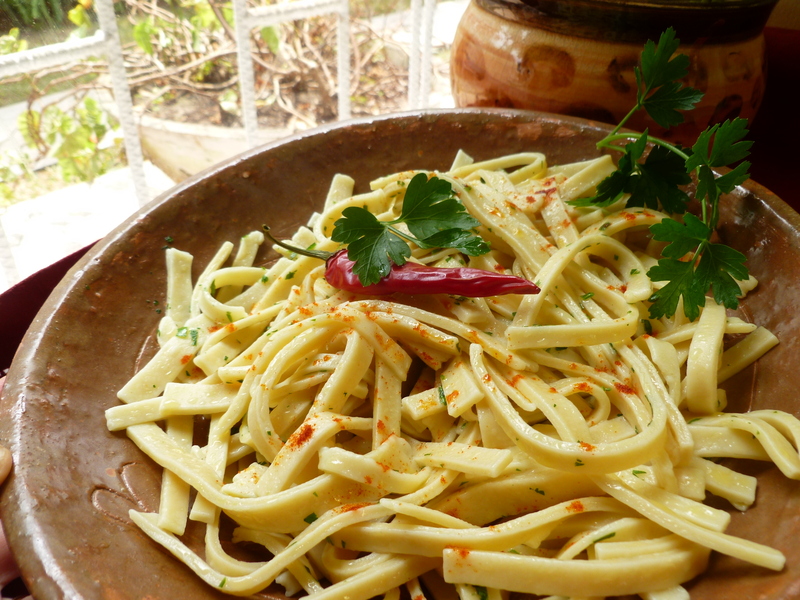 And A Suggestion: Homemade Egg Noodles, served with Homemade Fresh Tomato Sauce, a bowl of grated fresh Parmesan cheese and a salad makes a nice Light Lunch. A recipe for Homemade Fresh Tomato Sauce is here in the previous diplomatickitchen post for Cream of Pecan Soup. This is an excellent blog. We had a go at making our own spinach pasta the other day and were pleasantly surprised at how easy it was. We did end up breaking our pasta machine but had more fun hand rolling it and cutting it without the machine so we figure it did us a favour by giving up the ghost. Thank you very much for this delicious looking recipe. You are welcome and thank you for the feedback. I agree, spinach pasta is surprisingly easy to make. 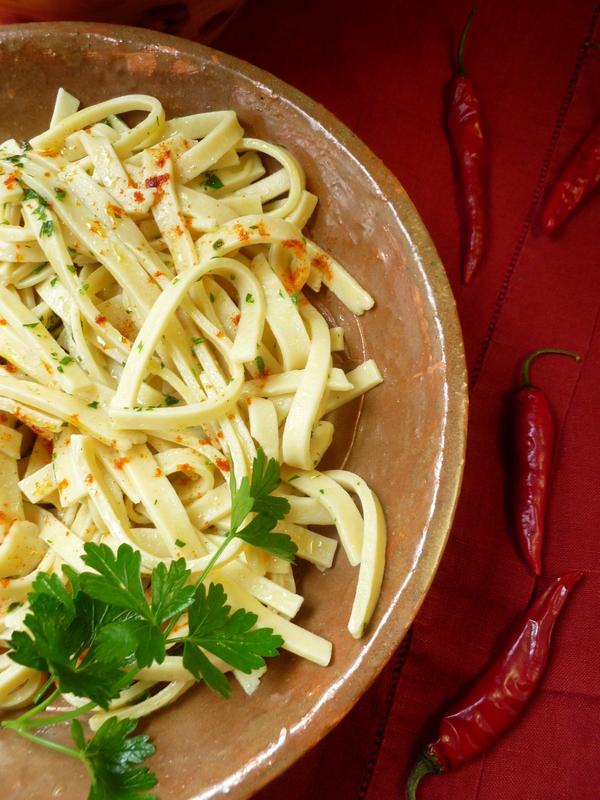 And Mr. Crouch might agree with you about the fate of your pasta machine :-)…. Now, here is a cookbook trivia question for you…not a rhetorical one. The Edna Lewis Cookbook (1972) was Edna Lewis’s first published cookbook. Why is it that current references to that book omit the co-author, Evangeline Peterson? I have a copy of the book and the spine definitely reads “Edna Lewis and Evangeline Peterson”. I’m just throwing out the question… I’m curious and would be interested to know how Miss Peterson dropped out of the picture. I plan to write more on my blog about this journey in the coming months, but unfortunately I am no stranger to pretty much any processed food product you can think of, including (gulp, cringe) Tyson’s frozen chicken finger. Ugh!! Now I cook almost entirely from scratch. I am clueless as to why the second author was dropped from the cookbook in question. Did Google give you any answers? Evangeline Peterson does not appear to be someone who ‘Googles’ easily. A paperback edition came out in 1989 and she is listed as a co-author. But in articles about Edna Lewis, including her obituary in the Times, only Miss Lewis is credited with authorship.